The mother of a teen accused of murdering a man for a pair of expensive headphones says police have nabbed the wrong person. “I know for a fact my son was home and they’re accusing him of murdering this boy that he don’t even know,” Lakasha Hardy said as tears streamed down her face. 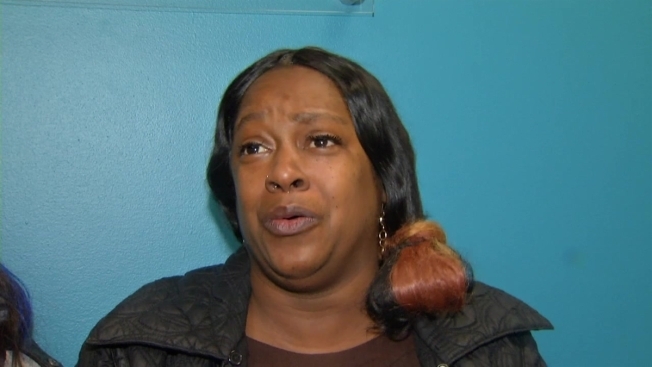 Flanked by two of her other children, the mother of 19-year-old Arkel Garcia came to NBC10 on Tuesday morning to say the teen could not be the person who shot Christian Massey on Saturday, Nov. 30. Massey, 21, was walking to a nearby friend’s house just before 5 p.m. when he was confronted by a robber in an alley near 58th Street and Lebanon Avenue in the Wynnefield section of Philadelphia, according to Philadelphia Police. Witnesses say the robber demanded Massey’s Dr. Dre Beats headphones, which retail for $300, and when the man tried to run, the robber opened fire. Massey was hit in the chest and left bleeding on the ground. The suspect ran, leaving the headphones he'd sought next to Massey’s body. When police arrived, Massey was still conscious and told officers an unknown male tried to rob him, officials said. He was rushed to the Hospital of the University of Pennsylvania and later died. Police eventually arrested Garcia and, this week, charged him with Murder, Robbery and related offenses. Hardy, who lives on the same block where the shooting took place, tells NBC10 that Garcia was at home watching movies on the front porch at the time of the shooting. She says her 14-year-old daughter also saw him there. Hardy says her son spent time hanging out with his girlfriend at the house and did not leave except for two hours on Sunday. Tyrell Smalls, Garcia’s older brother, says he was talking to the teen on Saturday evening and nothing seemed out of sorts. “I think if he would have done something like that he would be a little different or something because I don’t think you could do something like that and not be acting your normal self,” he said. Garcia has a past criminal record for possession and is currently on probation. Hardy says the teen has been working hard to stay out of trouble since that incident – only going to school to get his high school diploma and to a court-ordered drug treatment program. On Saturday, Dec. 7, a full week after the murder, Hardy says her son went missing. Thinking the worst, the mother says she spent several days calling police, hospitals and the morgue searching for Garcia. But Hardy says she later learned he wasn't missing, but rather in police custody, after the teen's friend told her he had been arrested. She says officers at several districts in her area said they did not know of the teen's whereabouts and that he was not in their custody prior to learning about his arrest. “I feel like they should have come to me and let me know that they had my son in custody,” she said. The mother also says police have yet to speak with her about the case. NBC10 reached out to Philadelphia Police about Hardy's claims. Police spokesman Lt. John Stanford said in Garcia's case, like every other, evidence is collected and presented to the Philadelphia District Attorney's Office. Prosecutors then decides whether charges should be brought forth. “Our homicide unit does an outstanding job and if they have enough evidence to bring forward charges, they bring that evidence to the District Attorney's Office," he said. Lt. Stanford also said the department has no obligation to keep a defendant's family abreast of case developments.